The most-booked non-white Latina model at New York fashion week was Isabella Melo. Here she is, from left, at Edun, Honor, and Ruffian. Here are the other top Latina models of New York fashion week. From left: new face Cris Urena (shown here at Ruffian) walked seven shows, Juana Burga (shown here at Costello Tagliapietra) did nine, and Simone Carvalho (shown at Elie Tahari) did seven. Chinese supermodel Liu Wen walked in 20 shows; this is her at, from left, 3.1 Phillip Lim, Proenza Schouler, and Anna Sui. 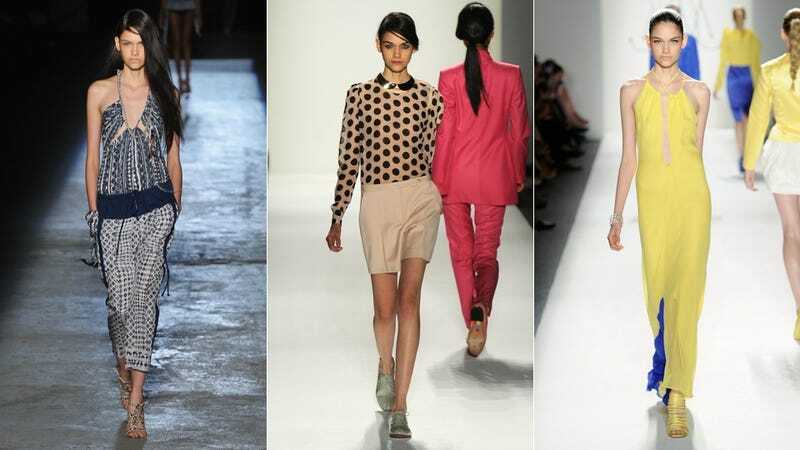 The other top models of Asian descent were, from left, Fei Fei Sun with 19 shows (shown here at Theyskens' Theory, where she was only one of two non-white models in the cast), new face from Nepal Varsha Thapa with nine shows (shown here at Prabal Gurung), and Xiao Wen Ju with 18 shows (shown here at Jill Stuart). Jourdan Dunn was the most-booked black model at New York fashion week. She walked in 17 shows. Dunn is pictured in, from left, Carolina Herrera, Marc Jacobs, and Marchesa. The other black models who were most popular with designers were, from left, Anais Mali with 13 shows (pictured at Sophie Théallet), Herieth Paul with 12 (shown at Zac Posen), Melodie Monrose with 12 (shown at Badgley Mischka), and Nyasha Matonhodze with 14 (shown at Marchesa). There were, relatively speaking, a lot more black models debuting at New York fashion week for designers and casting directors to choose from. The new faces who got the most work were, from left, Genesis Vallejo (shown at Milly) with five shows, Jasmine Tookes (shown at Peter Som) with eight shows, Marihenny Rivera Pasible (shown at Rebecca Taylor) with five shows, and Senait Gidey (shown at DKNY) with seven. This season was also noteworthy because the supermodel Liya Kebede made a return to the runway. She did two of the week's top shows, Proenza Schouler and Alexander Wang. She's pictured here on the right at Proenza. Next to her in the triptych are new face Crystal Noriega, who walked four shows, at Marc Jacobs, and Tookes at Jason Wu. The models of other races who worked the most during this New York fashion week were, from left: the Tunisian Hanaa ben Abdesslem (shown here at Ohne Titel) with four shows; Alabamian Jenny Albright, who told a New Zealand fashion blogger that she is part Native American (shown here at Sachin + Babi) with three shows; Nastasia Ohl, who is of mixed Jamaican, Chinese, and German heritage (shown here at Rachel Zoe) with five shows; and Sharan Bala, who's part Lebanese, shown here at the one show she did this season, Rebecca Minkoff.